Early versions of Brixton’s own currency featuring an image of David Bowie are selling for four-an-a-half times their face value. Brixton Pound notes with a face value of £10 have sold for £45 on eBay. Collectors have been snapping up the notes because they have a fully colour image of Bowie’s Ziggy Stardust character. B£10 notes featuring the iconic image of the pop star, who died in January aged 69, are available for their face value from what is believed to the world’s first local currency cash dispenser in Market Row. The new ATM, which can be found in the covered market between Coldharbour Lane, Atlantic Road and Electric Avenue, is available during the market’s operating hours (8am–11:30pm Tuesday to Sunday and 8am–6pm on Mondays). Alternatively, the local currency is available on the Brixton Pound website, which charges £16.70 for a Bowie note including postage. All B£ notes feature local personalities, including basketball star Luol Deng and Second World War secret agent Violette Szabo. 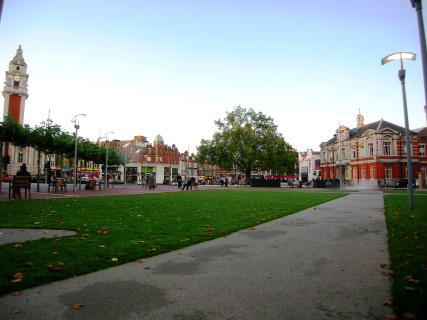 They can be spent at over 300 independent businesses in Brixton and are designed to build community connections, while keeping money in the area.